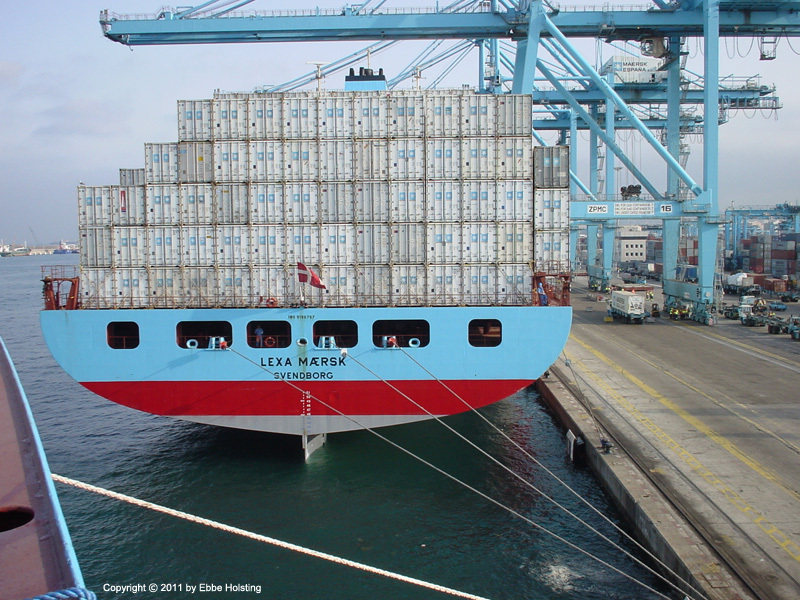 Welcome aboard the Laura Maersk! 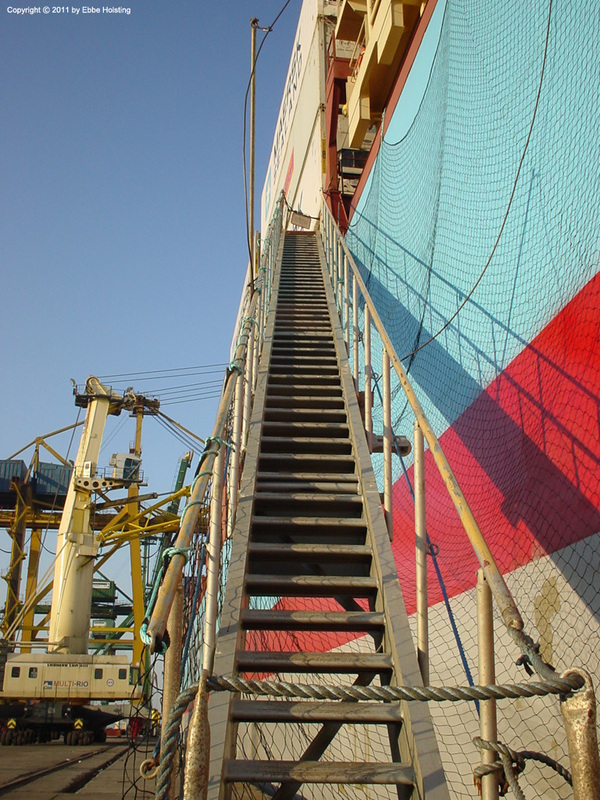 The gangway ladder rigged along the side of the ship, allowing access during port stay. A safety net is rigged in case someone drops something while boarding. 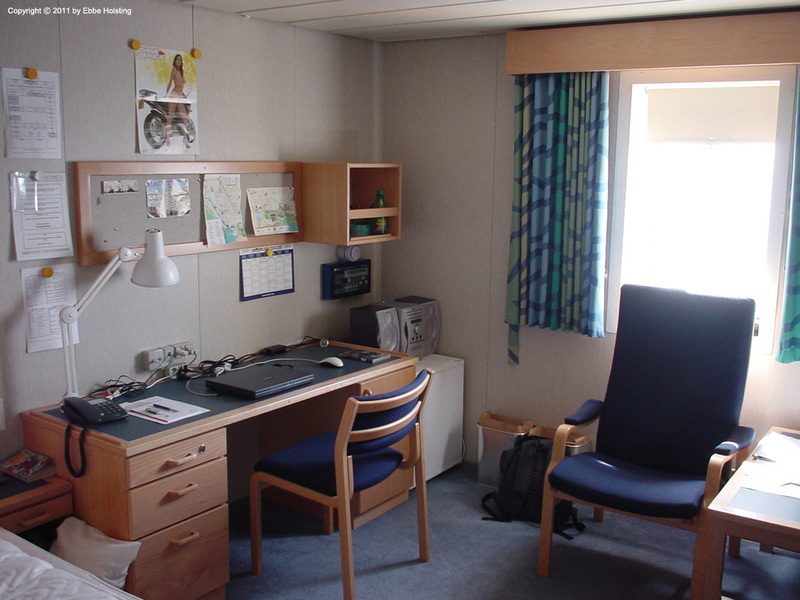 My cabin onboard, typical for junior officers, able seamen, ratings and cadets. The cabin includes a bathroom with toilet and shower. 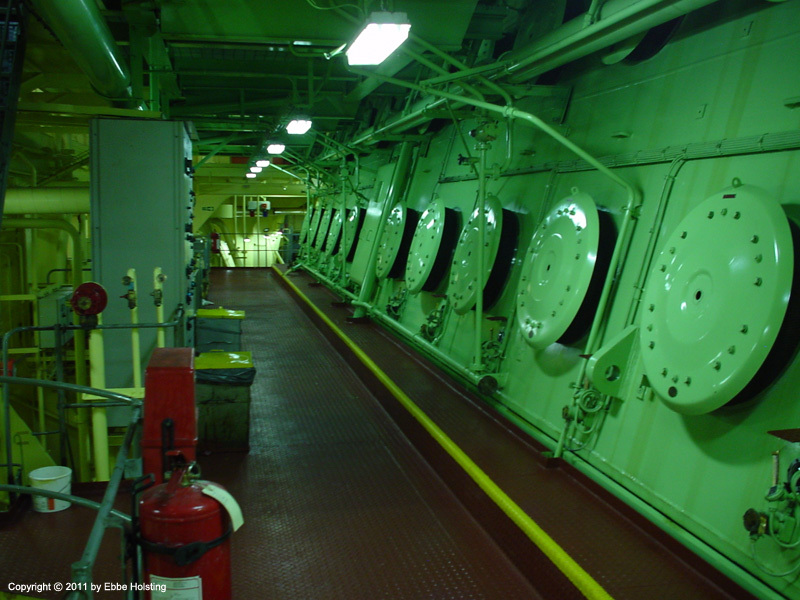 Senior Officers (Captain, Chief Engineer, Chief Officer, 1st Engineer) typically have larger cabins with separate bedroom and living room, and often the Captain and Chief Engineer also have a separate office. The laptop is my own, the refridgerator and stereo comes with the cabin. The top part of the main engine, a massive Burmeister & Wain two-stroke crosshead diesel engine producing in excess of 60000 horse power. This engine was a 10-cylindered model of B&W's proven K90MC design, a very reliable and servicable construction. 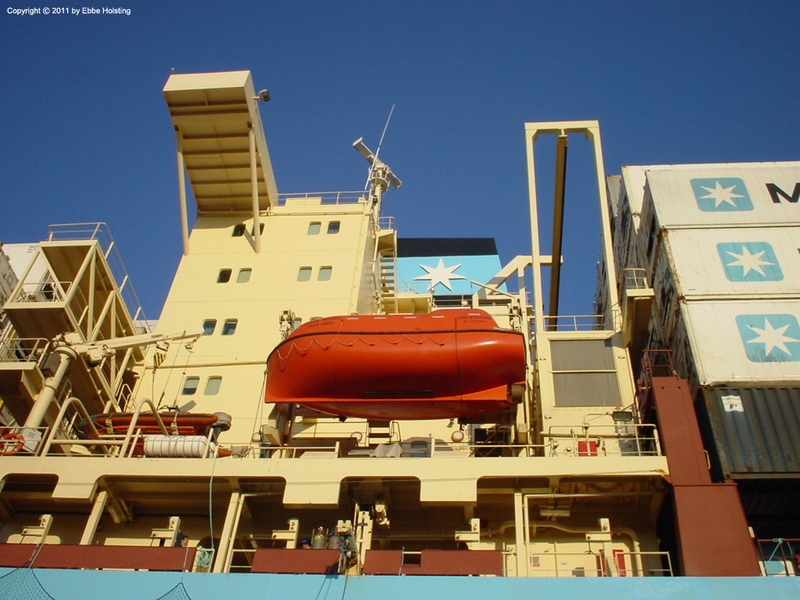 Traditionally, A. P. Moller - Maersk uses either MAN B&W or Sulzer engines	for their larger slow-speed-engine equipped ships. A closer look at one of the cylinders, here looking at the cylinder cover and exhaust valve, fuel pump visible in the foreground. The large silver tube is a hydraulic pipe for opening of the exhaust valve, and the three smaller ones are the high-pressure fuel oil pipes going from the fuel pump to the fuel injectors. The fuel pump and the exhaust valve actuator are operated by the engine's camshaft, located one deck below. Descending one deck below the engine top, we have a look at the camshaft covers. The chain driven camshaft runs the entire	length of the engine and is equipped with three cams for each cylinder. One operates the fuel injection pump, one activates the exhaust valve, and one is for actuation of a special diagnostics tool which can be fitted to measure engine performance. Windows in the camshaft covers allow the engineers to monitor the condition and lubrication of the cams and cam rollers. 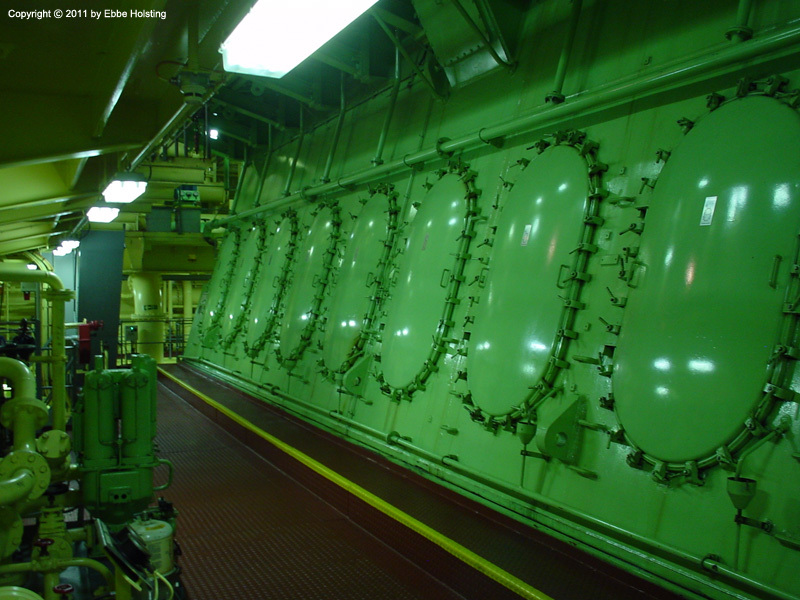 Descending another deck, we find ourselves at the crankcase doors on the port side of the engine. These allow entry into the crankcase for inspection and maintenance of the crankshaft, main bearings, crosshead and the lower part of the	piston rod. Starboard side of the crankcase, looking aft. Here the crankcase is fitted with expansion gates which provide pressure relief in the unlikely event of a crankcase explosion. The gates can be opened to allow access to the other side of the crankcase. The larger rectangular door halfway down the engine provides access to the camshaft chain drive and timing gear. 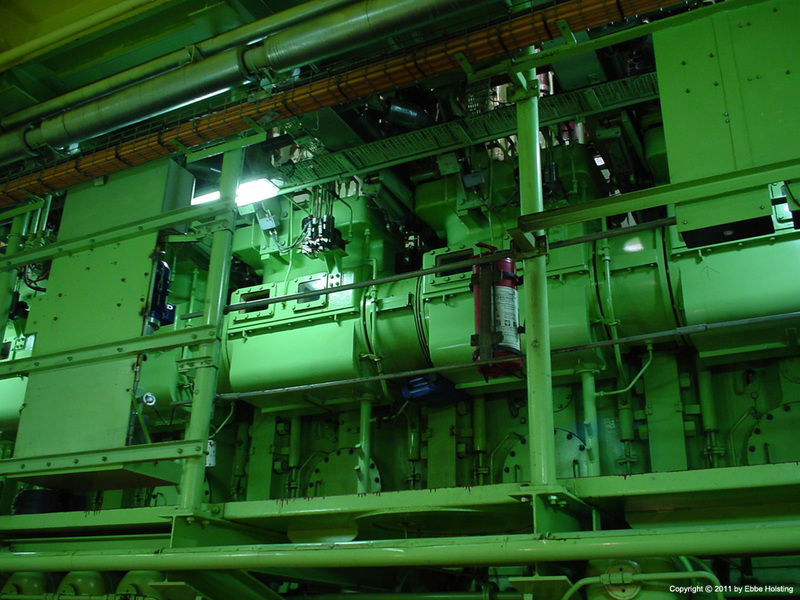 A view over the top of one of the ship's 5 auxiliary diesel generators, used for electrical power production for supplying the reefer containers, interior lighting, electric pumps, cabin outlets, bridge instrumentation etc. 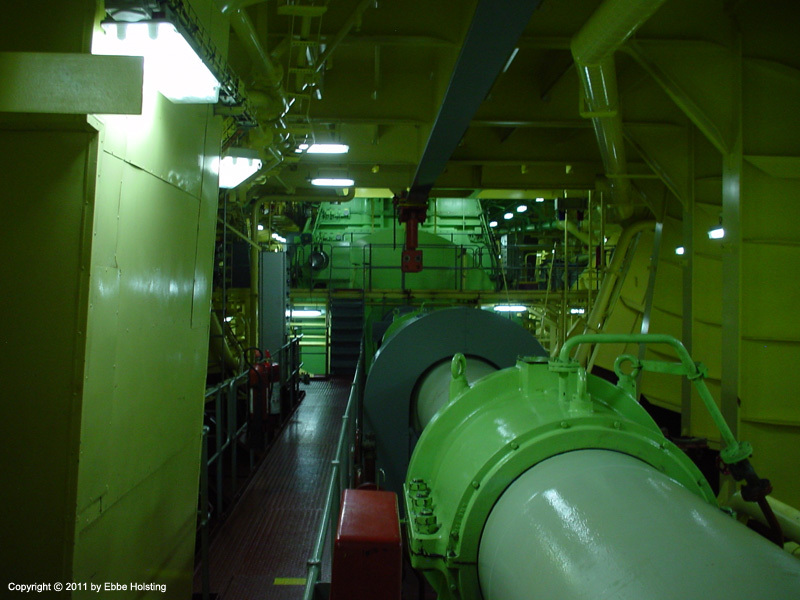 A ship naturally has to be equipped with its own power plant to cover all operational and domestic electic power needs. The auxiliary diesels were 9-cylindered MaK 9M25 4-stroke medium-speed diesel engines, delivering around 2500 kW each. 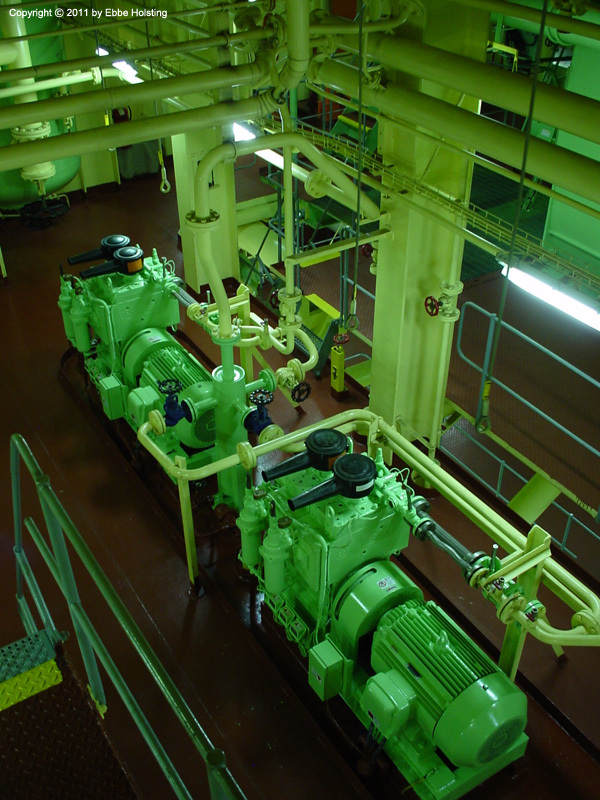 Two of the ship's three starting air compressors. The main engine as well as the auxiliary engines are started with compressed air at a pressure of 30 bar (435 PSI). 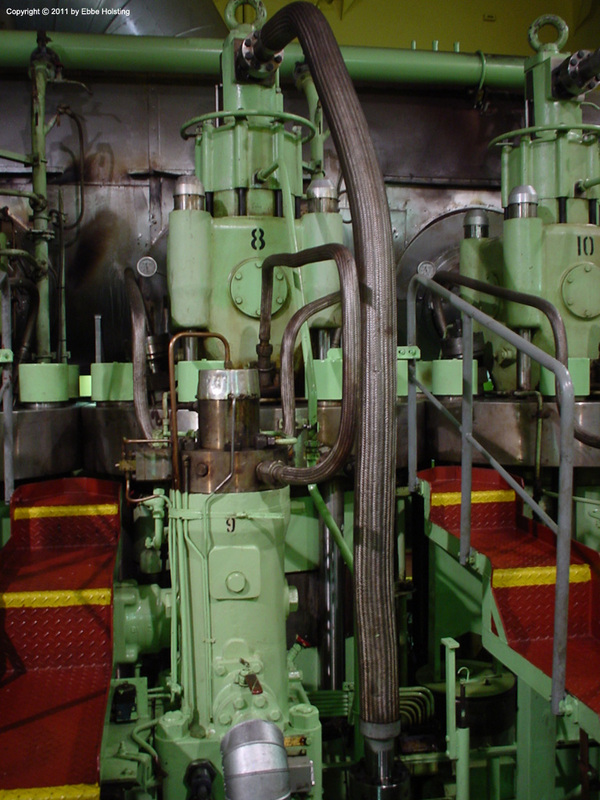 The air is let into the cylinders, forcing the reciprocating action of the crankshaft. Once revolutions have built up, fuel is injected and the engine springs into life. The Fresh Water Generator, turning sea water into drinkable fresh water by evaporation (desalinization). The fresh water generator is used when in open sea, and uses waste heat from the main engine for evaporating the sea water. 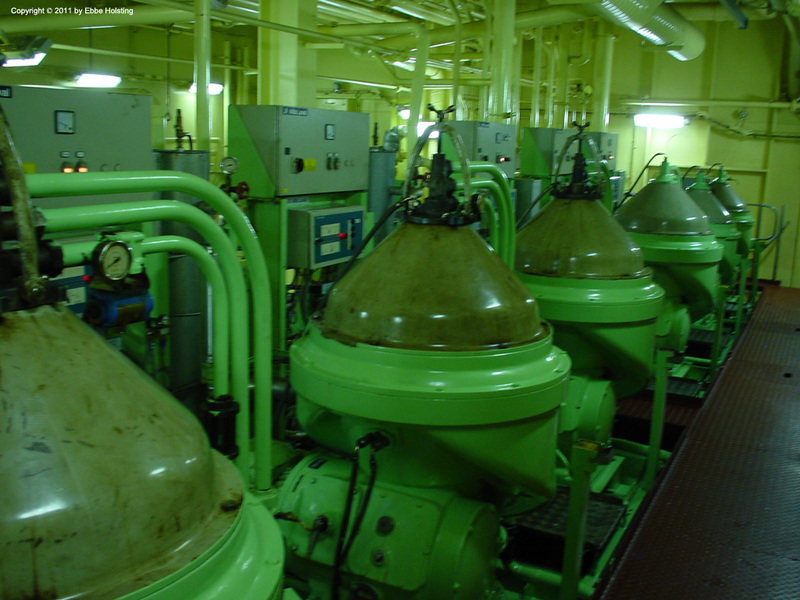 It is capable of producing around 25 to 30 tons of fresh water per day, which is stored in the ship's fresh water tanks. 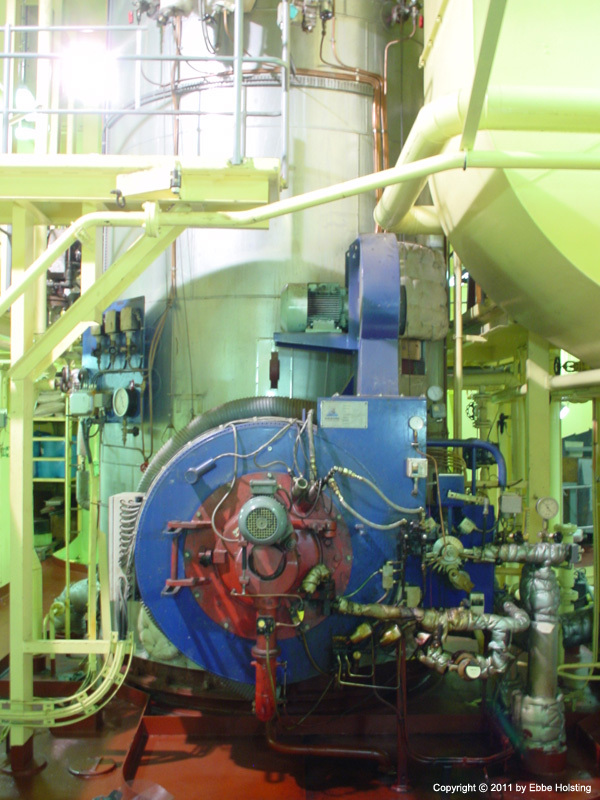 The Oil Fired Boiler (or Auxiliary Boiler), is used for steam production during port stay. When the main engine is running, the Exhaust Gas Boiler takes care of steam production, using waste heat from the engine's exhaust gasses. Steam is used for heating purposes, mostly for the fuel oil. Heavy Fuel Oil is very dense at room temperature, and has to be heated to about 90 degrees C in order to pump it. Steam is also used for heating the hot fresh water as well as cabin radiators. Fuel Oil Purifiers and Lubricating Oil Purifiers (separators), which are used for cleaning fuel and lube oil of water and solid deposits. An internal bowl rotates at several thousand RPM, whereby the centrifugal force causes water and particles to settle (separate) from the oil. The three first ones from left to right are the fuel separators, each with a capacity of about 6 tons per hour. Me walking beside the massive propeller shaft, transfering the horsepower from the main engine to the propeller. Larger ships are usually equipped with only one propeller, directly mounted to the main engine via a propeller shaft, without any reduction gear in between. The speed of the ship is then controlled by adjusting the speed of the main engine. At full speed, the Laura Maersk's main engine (and thus propeller) spins at only 94 RPM, giving the ship a top speed of about 26 knots. 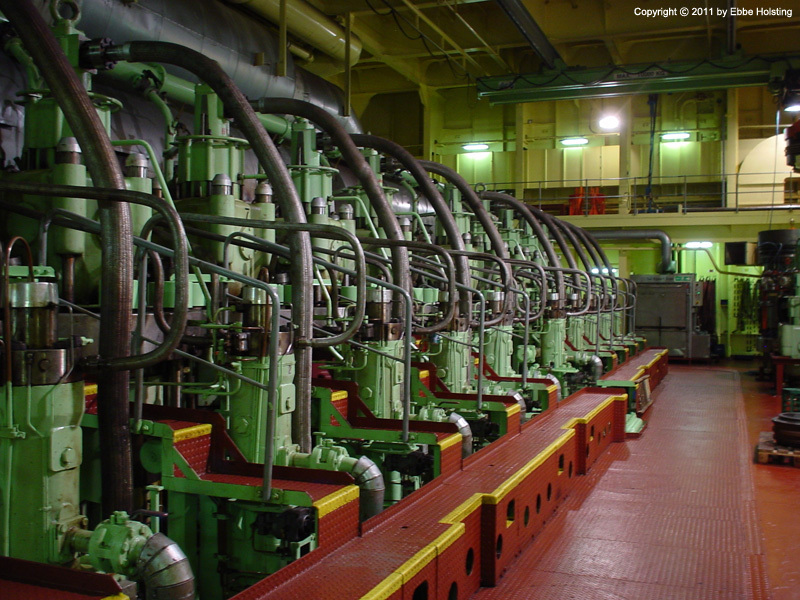 Rule of thumb when it comes to crosshead engines: larger engine equals slower revolutions. Another view of the propeller shaft, this time looking forward from the shaft tunnel. The aft of the main engine is visible. Your every-day modern family car has a power output of about 120 horsepower and a torque of about 170 Nm. The B&W 10K90MC has a power output of 61285 hp and a torque of about 4,000,000 Nm. 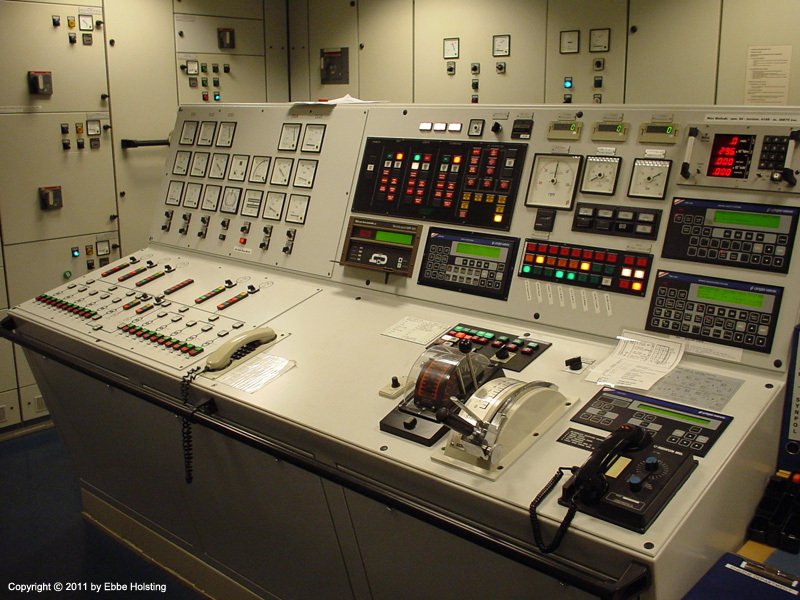 A view of the Engine Control Room main console, with controls for the main engine (right) and power production plant (left). The main engine is usually controlled from the bridge during manoeuvre and cruising, but can also be controlled from the engine control room in case the remote control system fails. The power plant controls enable the operator to connect and disconnect the 5 generators as well as monitor and control the electrical power distribution. An overview of the engine control room. 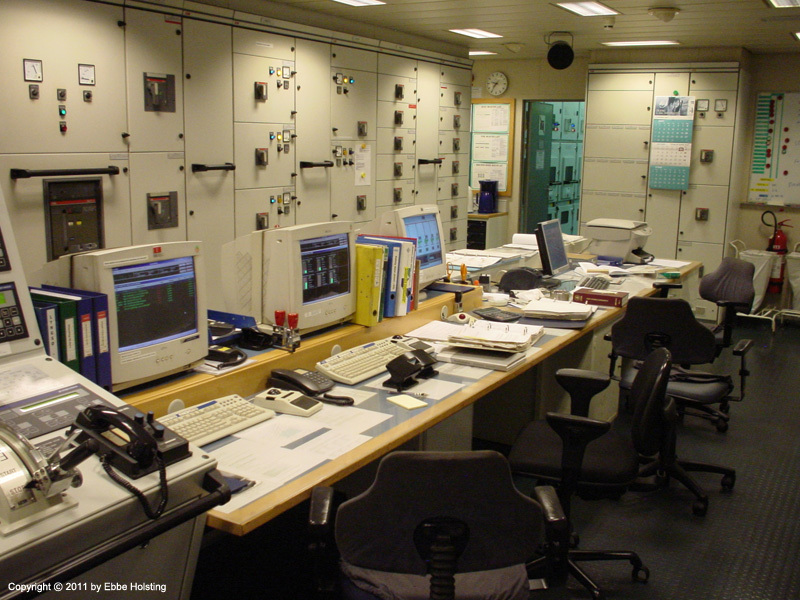 The two screens to the left are the engine room monitoring system (Integrated Computer System), from where parts of the machinery can be monitored and controlled. 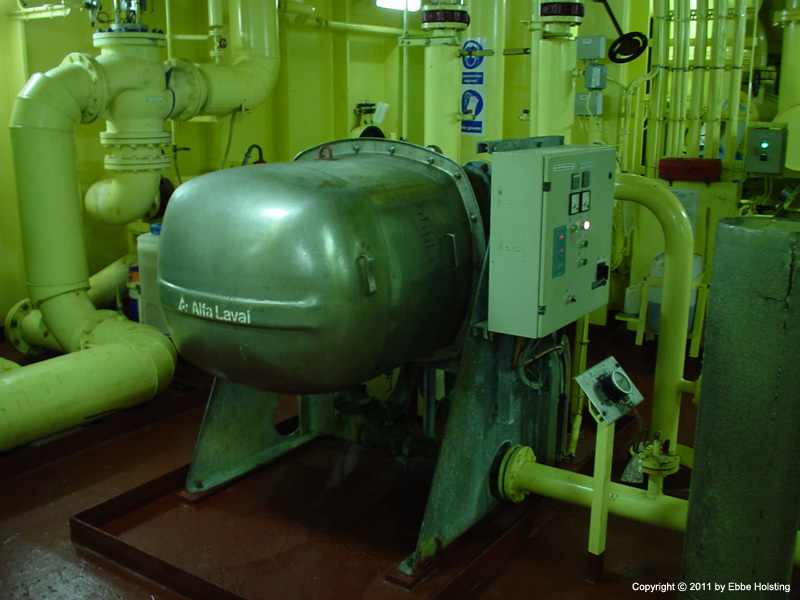 Modern ships are fitted with a high tech automation alarm and supervision system which measures several thousand temperatures, pressures, flows, levels etc. and gives alarms if anything is out of the ordinary. This system makes it possible to operate with Periodically Unmanned Machinery Spaces, where the engine room is unmanned during night time. If an alarm should arise during the night, the engineer on duty will receive in on an alarm panel in his cabin, and he will then go to the engine control room to acknowledge the alarm and take action. 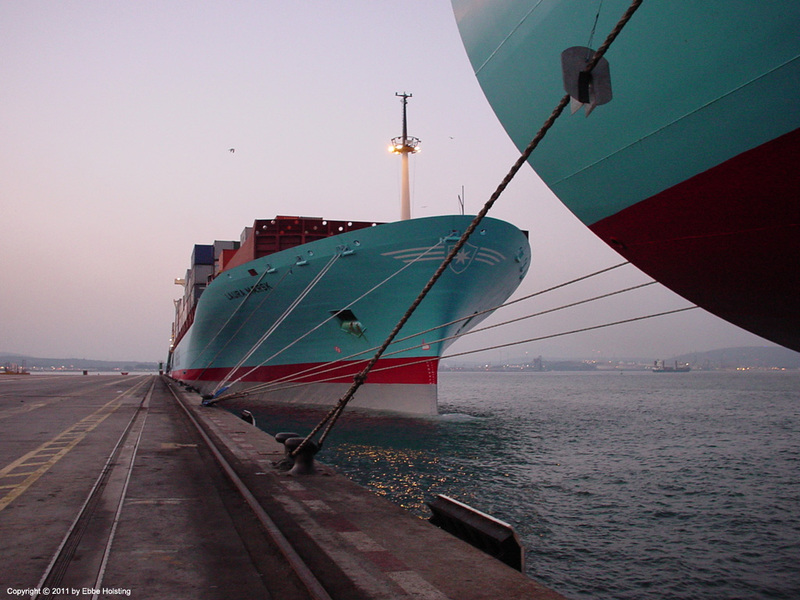 Entering the port of Algeciras, Spain, A. P. Moller - Maersk's main hub terminal in southern Europe. Apart from functioning like any other port, it is also one of the main transshipment terminals. Containers	from South America, Far East, Africa, northern Europe etc. are transshipped here from one route to another in order to reach its destination. 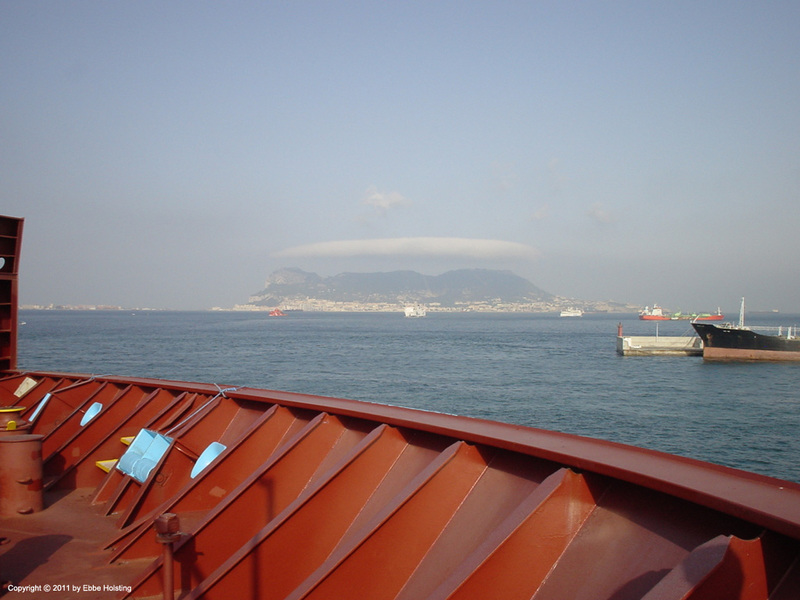 Viewing the characteristic Gibraltar cliff from the bow of the Laura Maersk during mooring in the port of Algeciras, Spain. 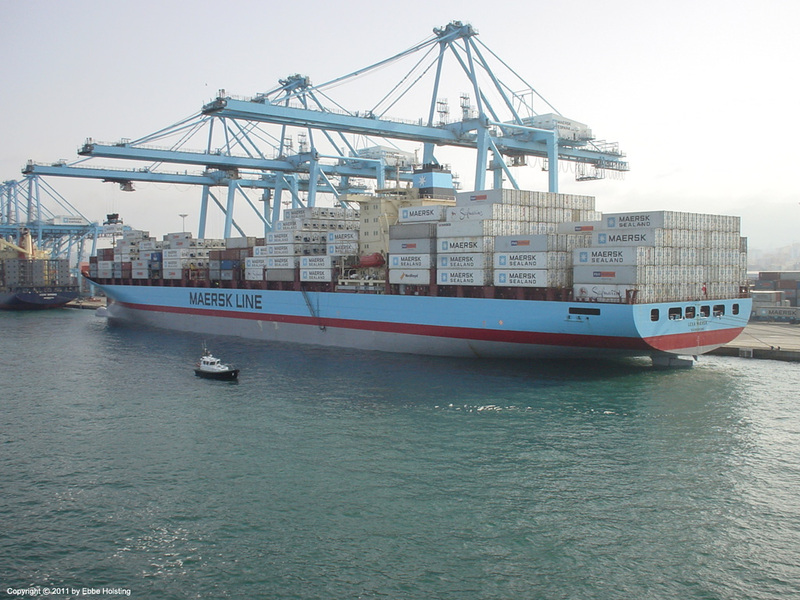 My "old ship", the Lexa Maersk, already at berth in Algeciras as we approached the pier. My twin brother was on board the Lexa Maersk at the time, so I was looking forward to mooring up and going over there for a visit. At the time we had satellite transmitted email available onboard, but not internet connectivity. We had been writing each other a lot the last couple of days in order to find out if we would be calling Algeciras simultaneously or not. By 2011 though almost all ships have internet connectivity onboard. Guess nothing can stop communication these days. 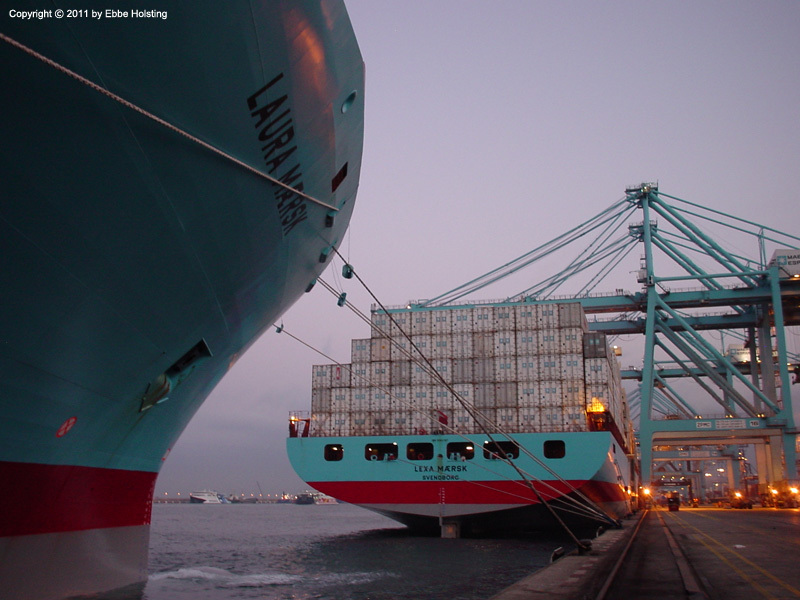 Approaching the pier aft of the Lexa Maersk. Lexa loaded up with reefers, most of them empty, headed back to South America to be refilled with exotic fruits, beef etc. 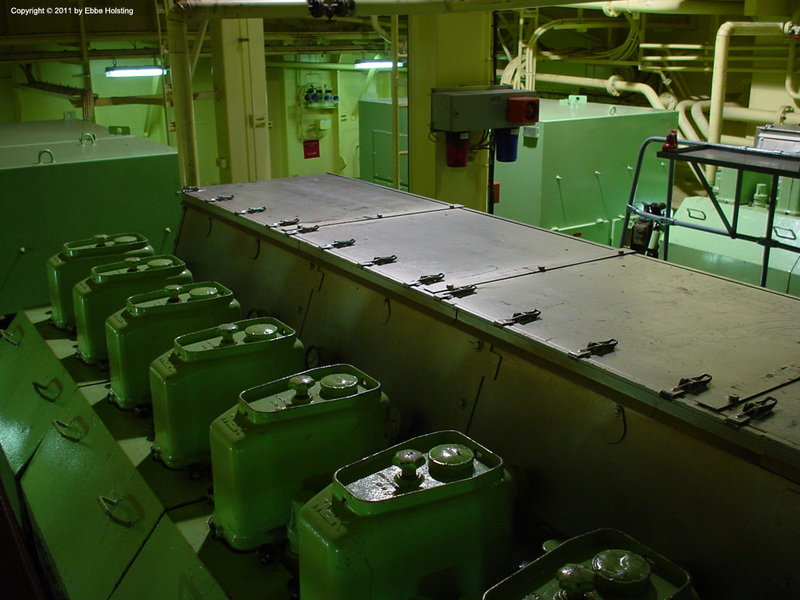 You can tell that they are empty in that you would never load live reefers above the 2nd tier on deck, since they would then be inaccessible for the ship's electricians. They monitor the reefers on a daily basis, and also have to be able to access them in case of breakdowns etc. Starting to moor up, with a bow line already tightened up. 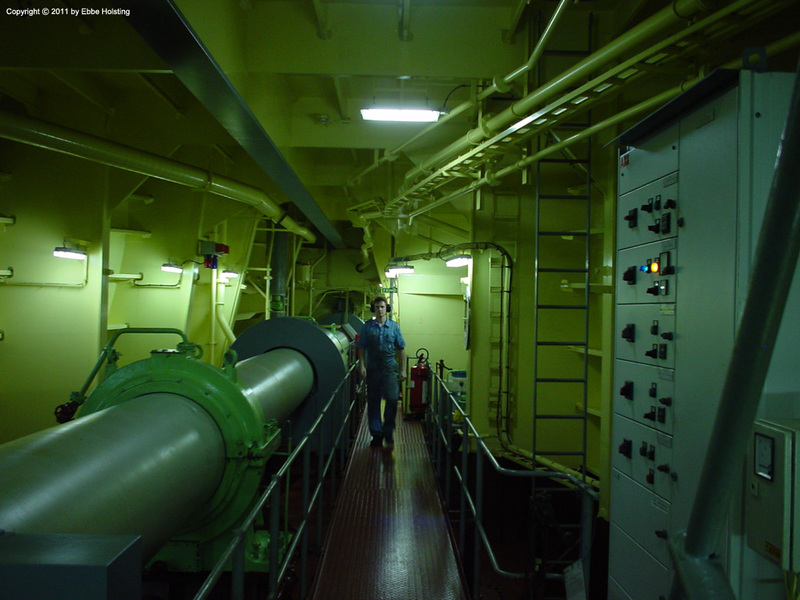 My brother can be seen standing on the starboard side of the Lexa Maersk main deck in a light-blue boiler suit. Finally off-duty at about 1800 hrs I went over to the Lexa Maersk to meet up with my brother, who was serving as a Dual Officer on board. It was a very special moment, arriving by ship and meeting up with your brother, who was there with another ship. 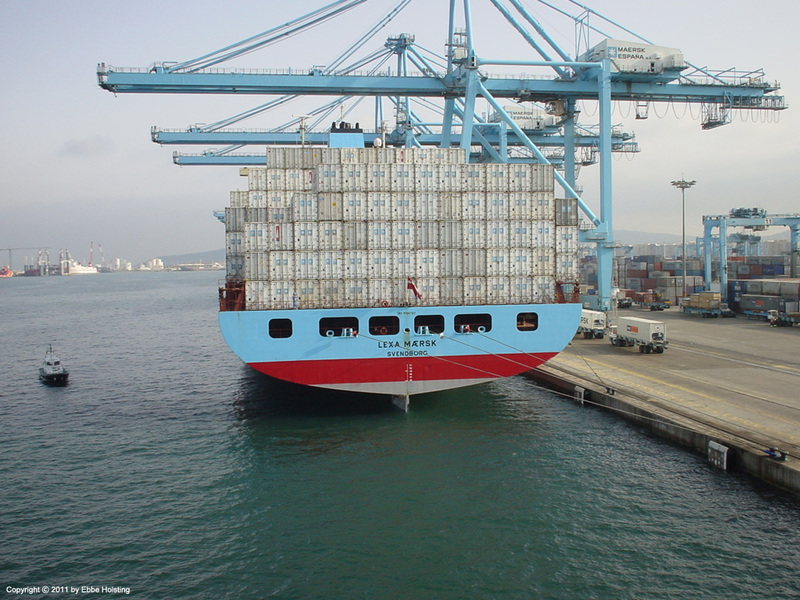 The beautiful bow of the Laura Maersk, moored alongside in Algeciras, Spain, with three head lines and two bow spring lines. Having almost just arrived, no gantry cranes had arrived in place on the pier yet. Cargo operations would commence when the Lexa Maersk, moored in front of us, had completed her operation and had departed a couple of hours later. 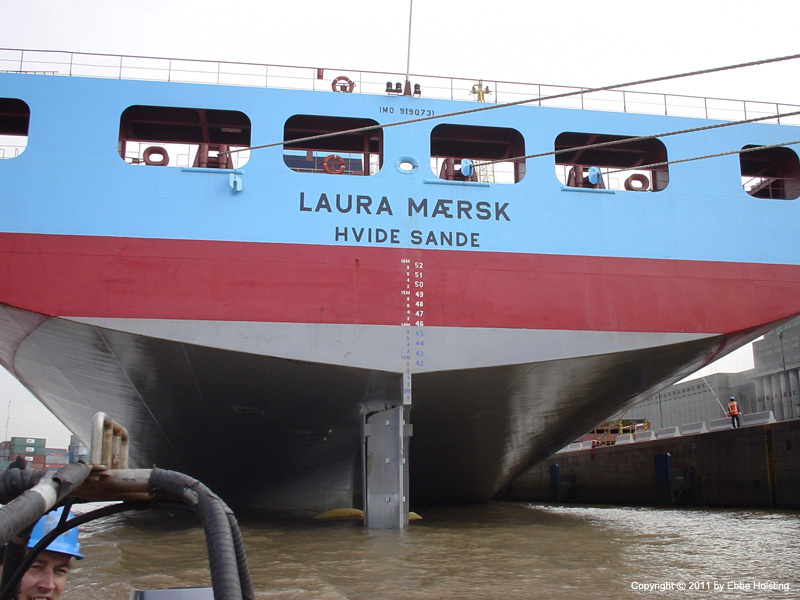 Another view of the bow of the Laura Maersk, with the stern of the Lexa just visible. 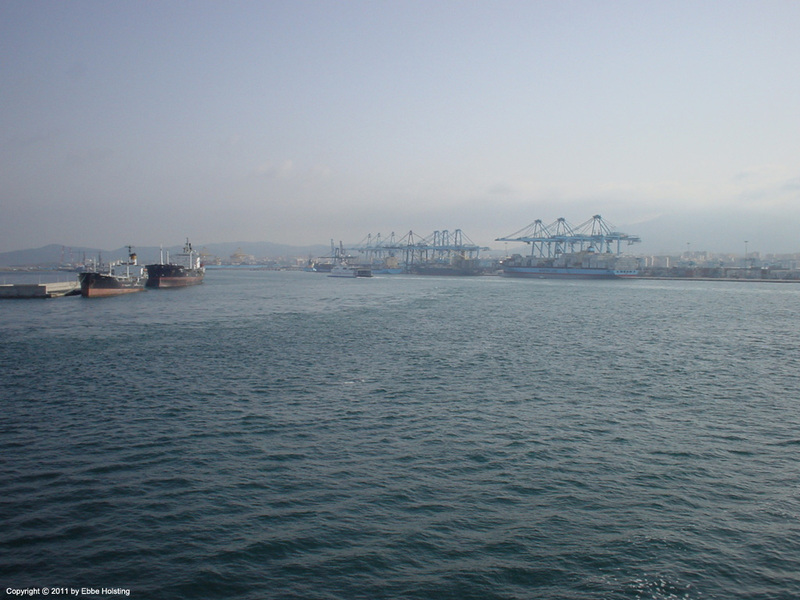 Algeciras is typically a very busy harbour, so we were lucky to be able to go alongside before gantry cranes were available to commence the cargo operation. Usually a swarm of cranes drive up to the vessel while she is still busy mooring up, not wasting any minutes alongside. However this differs a lot around a globe. In the far east they almost start unloading containers before you reach the pier, whereas in Africa and South America things seem to operate at a somewhat slower pace. Some weeks later we had completed the European rotation and reached South America. 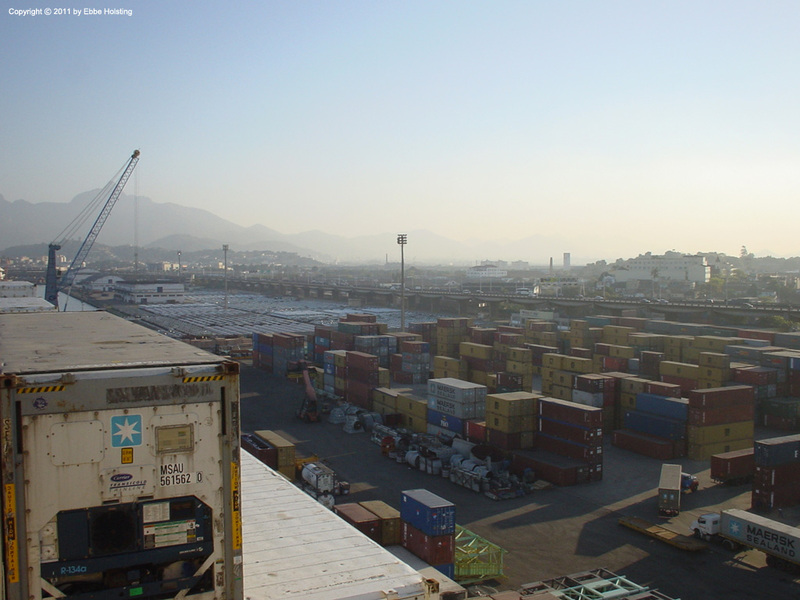 The port of Santos were having problems with congestion at the time, so we were re-directed to Rio de Janeiro instead. This naturally went down well with the crew who were looking forward to seeing the Brazilian metropolis. A view over the aft deck towards downtown Rio de Janeiro, Brazil. 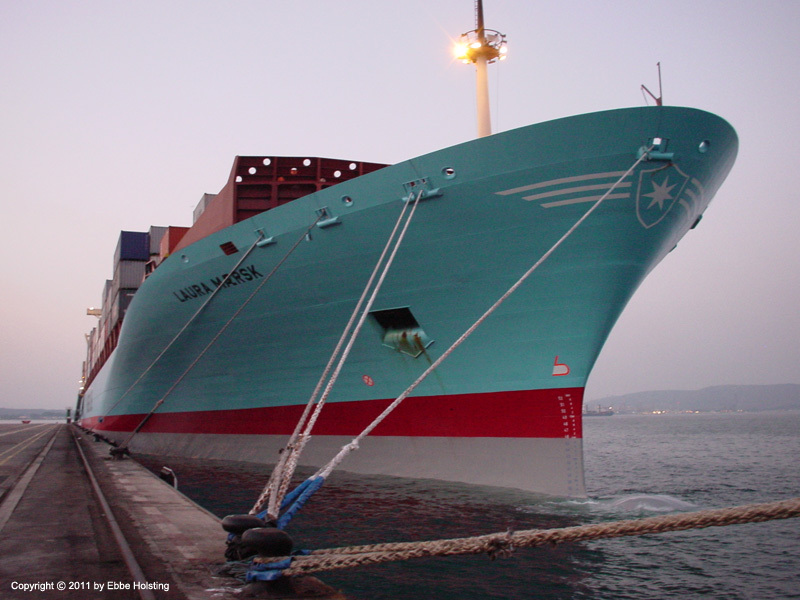 Our call being extraordinary, the port was not used to ships of the size of Laura Maersk, so the port stay took a couple of days. Empty 40-foot reefers being unloaded. An empty 40-foot reefer container weighs about 5 tons, so the discharging process is sped up by lifting them two at a time, with the bottom one hanging in the twist locks attached to the corners of the upper container. A mobile crane and an elderly gantry crane working our deck cargo. The contrast to i.e. Japanese ports is extreme. In Japan the pier along a container ship is typically packed with as many gantry cranes as can possible be squeezed in, cutting port stays down to as little as 6 hours. 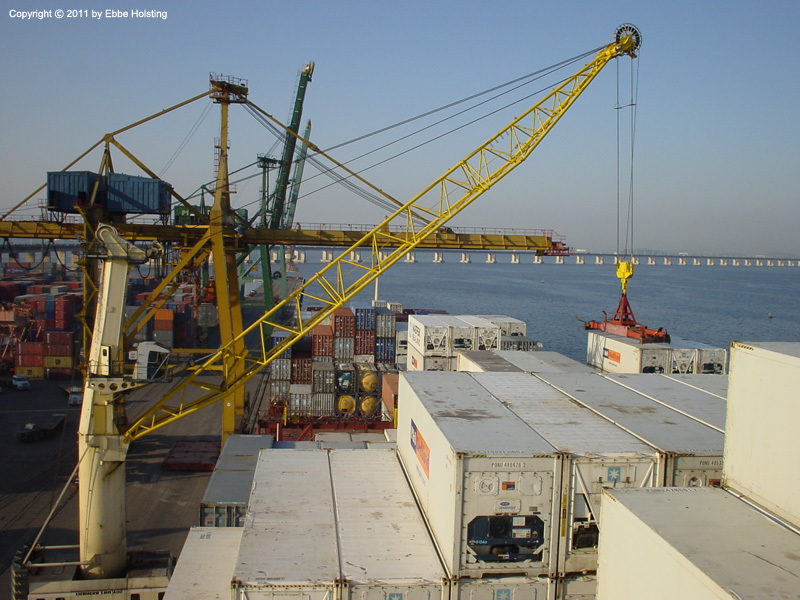 In South America though, a couple of mobile cranes and an old gantry is not a rare sight, providing much longer port stays. This might be popular with the crew, but in modern container transport industry, speed is money. Taking a walk on the pier in Rio de Janeiro. The two green gantry cranes in the background belong to another terminal, and as such did not work our vessel. A container port typically consists of a number of terminals, with different companies and terminal owners operating a length of pier. 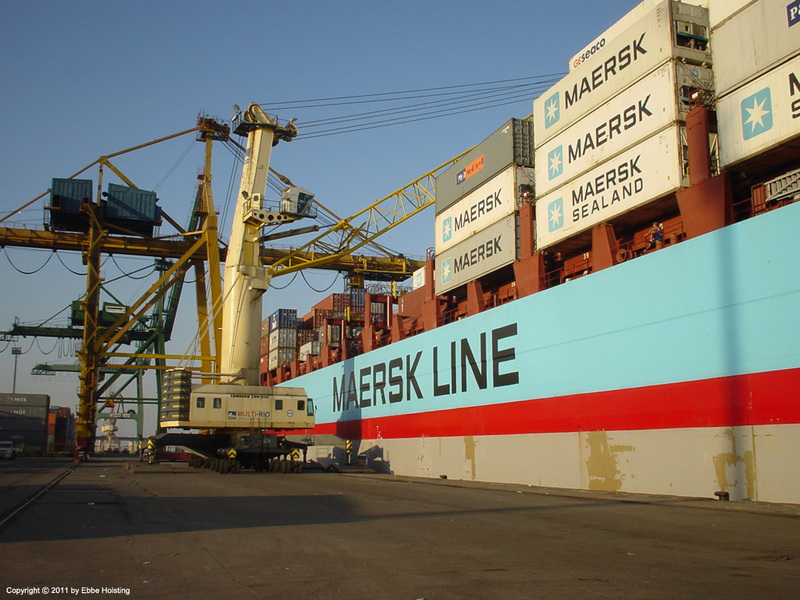 Maersk has its own terminals in many ports, but not here in Rio. 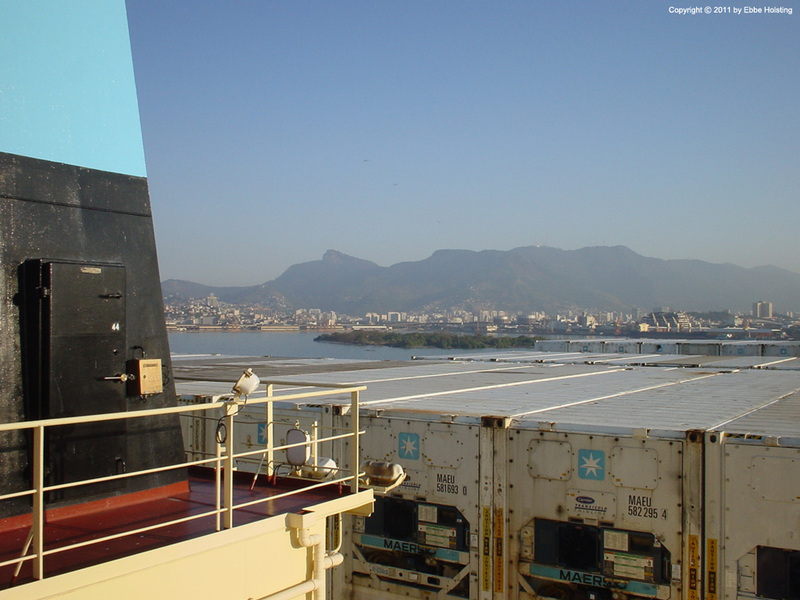 Maersk operates a terminal in the port of Sepetiba, not far from Rio de Janeiro though, but it was busy at the time, prompting us to go to Rio instead. A view of the port side of the accommodation from the pier in Rio de Janeiro. 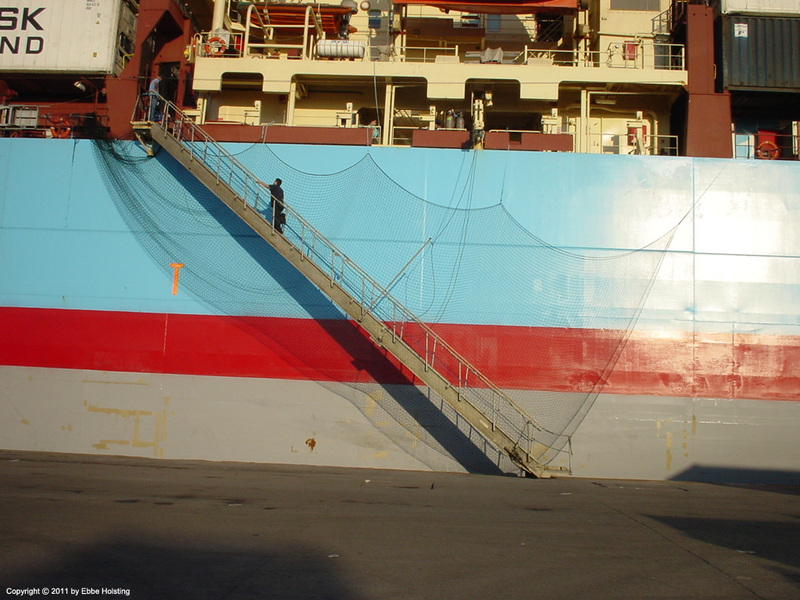 The ship's agent scaling the gangway ladder. Shipping companies utilize agents in all ports of call, either from an in-house or chartered agency. 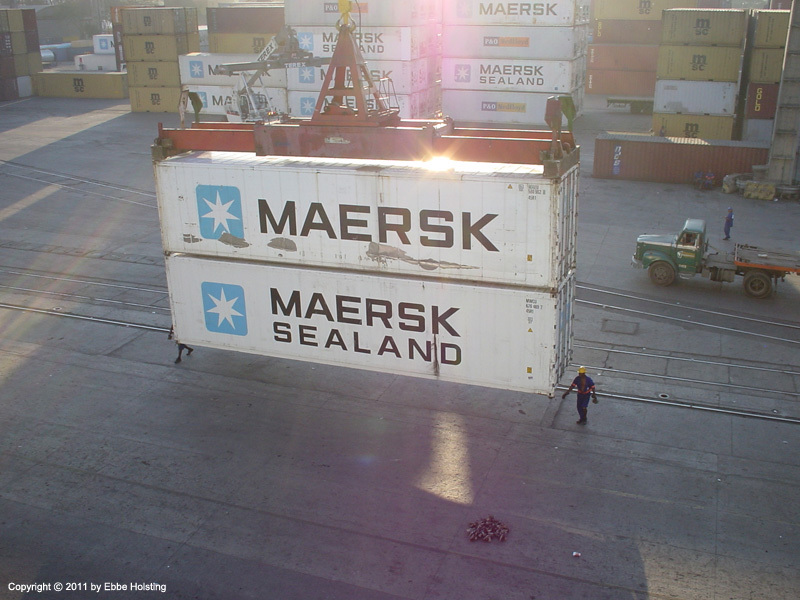 Maersk has agencies in several ports all over the globe, servicing own and other's ships. The agent is the ship's liaison in the port and takes care of required arrangements prior, during and after the port stay, such as ordering of pilot and tug boats, reporting to authorities, arrangements for crew changes and deliveries of provisions and stores etc. He also takes care of any matters arissen during the port stay, and functions as the ship's representative towards third party. The bow as viewed from the Man Overboard Boat (dingy) during port stay in Buenos Aires, Argentina. 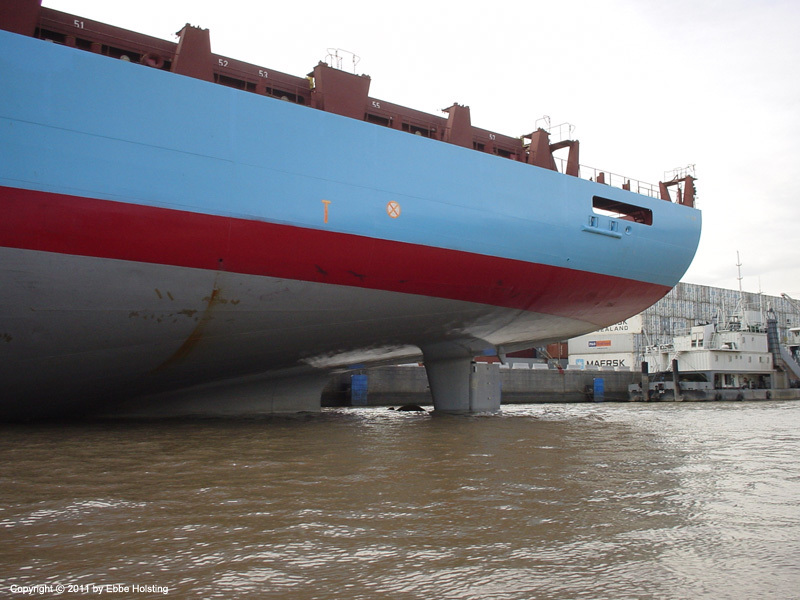 The port of Buenos Aires has a rather low water depth, so we had to be very attentive with regards to our draft when calling this port, and also while moored alongside due to tidal variations. Buenos Aires was the final port on the voyage before we headed back north, loading in Montevideo, Rio Grande and Pecem. Not much cargo left on board for this reason. Before we left Buenos Aires, however, we typically loaded several hundred reefer containers in the cargo holds, most of them container fruits or beef. 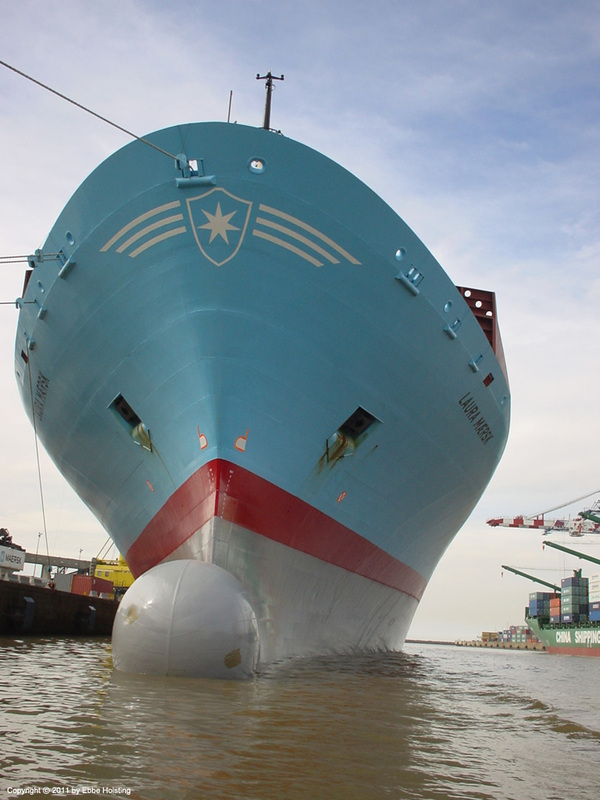 The mighty stern of the Laura Maersk. The ship's port of registry is the Danish port Hvide Sande, however it is doubtful that the ship would even be able to call this port due to its size. The propeller is just visible, showing a feet or two above the muddy water.